Are you a history buff? Or maybe looking to fill a few gaps in your knowledge of the Second World War? Dive deep into this intriguing and fascinating era as you embark on a historical journey through the key moments of the German Occupation in Paris. This captivating historical tour is sure to please history fans of any caliber, leading you to where the battles for France’s freedom played out and casting a light on the defining moments of Paris’ darkest hour. You will meet our guide “Localers” just outside Saint-Paul metro station. The tour begins in the Marais quarter where your guide will tell you about the somber days of the Nazi invasion, you’ll revisit the triumphs and tragedies of the past as a knowledgeable guide reveals hidden details and forgotten stories of food rationing, curfews, and other hardships. You will explore after the city’s Jewish quarter to learn about the difficulties of daily life under German rule, an existence riddled with the fear and uncertainty of constant roundups and deportations. Uncover surprising plot twists of collaboration and anti-Semitism that still today cast a dark shadow over the events of the time. 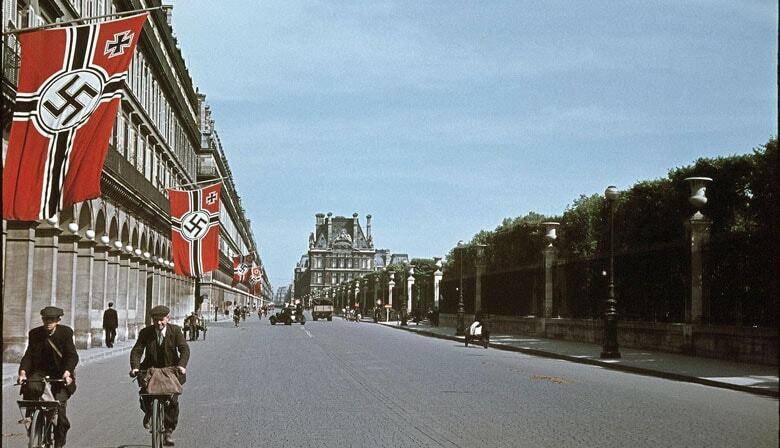 Before reaching the Ile de la Cité, you will obviously stop for a short time at Paris’s Holocaust Museum. After a coffee break at a local café, your guide will show you the hidden artillery impacts on walls and symbolic monuments such as Notre-Dame cathedral, Conciergerie, Paris Prefecture that reveal the reality of the war’s atrocity. You will see some of the places where the important battles took place. But this story has good guys in it too, so your guide will also recount the hopeful and courageous stories of those who risked life and limb to protect the persecuted, including the efforts of the underground French Resistance movement that would light the spark of insurrection and help liberate Paris from its oppressors. Heroes like De Gaulle, Leclerc, and the famed Monuments Men will all get a mention. Whilst you learn shocking details of Hitler’s ultimate plan for Paris and how the city narrowly escaped certain doom thanks to the actions of one man, your guilde will bid farewell at Pont-Neuf. You will receive your confirmation and your tour voucher in 2 separate emails. Meet your guide just outside the "Saint Paul" metro station on line 1. There is only one exit when leaving the station. The exact address is 129 Rue Saint-Antoine, 75004 Paris. Your guide will be waiting for you close to the carousel. He will be wearing a special badge with the Localers logo, you can't miss it! Wonderful historical tour of Paris! Our family of four (we have two teenage daughters) started our visit in Paris with this tour, and we were very impressed with our tour guide Tobias. He knew so much of the history of the city, and it was a perfect way to start our week there because it gave us all the background information that we needed for our subsequent tours in Normandy at the D-Day beaches, and even of the Louvre. Besides being very knowledgeable, Tobias was also very friendly and personable. He took the time to try to get to know each of us on the tour so that he could give us individual recommendations on things to do and where to go while we were visiting. In addition to discussing the history of Paris and World War 2, he also showed us good places to shop and eat. He genuinely enjoys his work, and it was a pleasure to have him as a guide. I would definitely recommend this tour with Tobias! Okay but not as great as expected given reviews and comments from friends. Guide’s ability to bring the stories to life is important. Our guide Victor was excellent! Was an amazing tour. The tour guide was excellent providing great insight into what it would be like in France during WW2. Seeing some of the amazing historical landmarks and hearing some of the little know stories of heroism was the highlight of our time in Paris. Would recommend everyone do this tour.